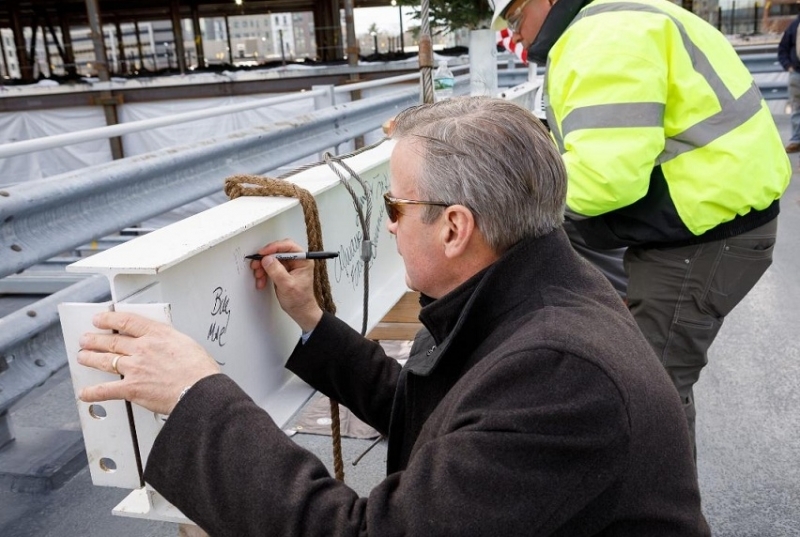 CAMBRIDGE, MA – December 13, 2017 – The Davis Companies and John Moriarty & Associates today celebrated the ceremonial “topping-off” of the Alewife Research Center (The ARC), a new state-of-the-art lab building located at 35 Cambridgepark Drive. This major milestone marks the completion of the structural phase of construction and positions the project to be delivered on schedule and available for occupancy by life science tenants in fall 2018. The ARC is a 223,000 square-foot transit-oriented Class A lab building, strategically located directly adjacent to the Alewife MBTA Station, minutes from both Kendall Square and Harvard Square via the MBTA Red Line, and readily accessible from the Metro West suburbs via Route 2, the Minuteman Bikeway and four other bike paths. This premier location provides significant value for life science and pharmaceutical companies requiring flexible laboratory space and broad access to both urban and suburban talent pools. 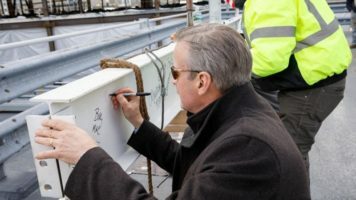 The event included remarks from Brian Fallon, President of TDC Development Group, a subsidiary of The Davis Companies, and was followed by the traditional lifting of the final steel beam into place. Committed to excellence in both investment performance and operations, The Davis Companies is an integrated real estate investment, development and management firm headquartered in Boston that has invested more than $4 billion in gross asset value through real estate equity, debt, and fixed-income securities. A combination of capital markets, development and management expertise allows The Davis Companies to nimbly tackle complex and contrarian opportunities. 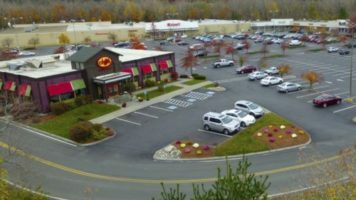 Directly, and with its valued partners, The Davis Companies currently owns a commercial real estate portfolio of approximately 12 million square feet across the Eastern United States. The ARC development project is a Class-A, transit-oriented, 223,000-square-foot lab building with ground-floor retail, located at 35 Cambridgepark Drive. Scheduled for completion in fall 2018, the property is ideal for growing companies seeking modern, new construction with an onsite parking garage, full amenities, and access to Greater Boston’s growing talent pool. The ARC is minutes from both Kendall Square and Harvard Square via the adjacent, MBTA Red Line Alewife Subway Station, and readily accessible from the Metro West suburbs via Route 2. This premier location provides great value for life science and pharmaceutical companies requiring flexible, Class A lab space in a sustainable environment.